Morecambe boss Jim Bentley admitted it was a tough task to leave out Mark Halstead for the weekend win against Crawley Town. The keeper had capitalised on Barry Roche’s injury last October to make 26 consecutive appearances for the Shrimps. In that time, he proved a steadying influence in goal and produced man-of-the-match displays in helping Bentley’s players to wins against Yeovil Town and Port Vale. However, he was omitted from the starting XI at the weekend after conceding four goals at Swindon Town the week before. 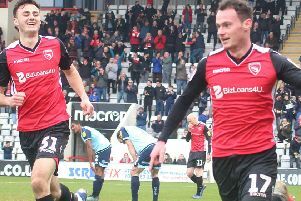 Roche, the Shrimps’ club captain, celebrated his recall with one good save in helping Morecambe defeat their visitors and climb the League Two table in the process. “It was a massive decision,” Bentley acknowledged. “When Baz was called upon he did well but he’s another who has had to wait because of the form of Mark Halstead. “Not all the staff agreed with me but I’m the one who has to make the decision. “I spoke to Mark after training because I didn’t want to do it on the day. “He took it on the chin but we’d conceded four away from home and six in the last three games. “You’re coming into a massive game and, sometimes, you do it with a gut feeling. It wasn’t just Roche who came in from the cold at the weekend either. Liam Mandeville’s winner was his first for the Shrimps since he netted the decisive goal in September’s win at Grimsby Town. Having made a favourable impression early on, the Doncaster Rovers loanee has had to wait his turn for a starting spot of late. “You look at the other end of the pitch and Liam Mandeville has hardly had any match time of late,” Bentley said. “He’s come out of the side at the same time the lads up front have scored goals.